Our WordPress plugin makes it easy to insert ActiveCampaign forms into your posts and pages. It also adds the Site Tracking code to your WordPress site. The site tracking code will let you track page visits and add the Conversations chat widget to your site. 2. Click “Plugins” in the sidebar. 5. 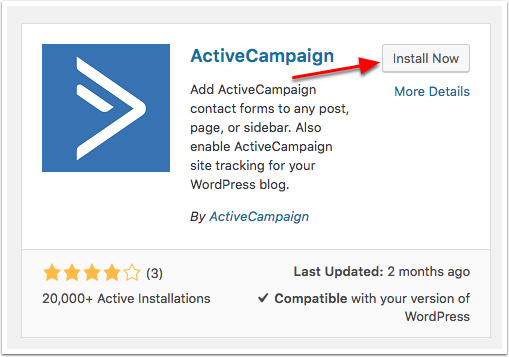 Look for the plugin titled “ActiveCampaign by ActiveCampaign.” Click the "Install Now" button. We recommend opening a new tab (you'll need to be able to switch back and forth between your ActiveCampaign account and your WordPress site) and logging into your ActiveCampaign account. In the steps below, we'll show you where you can access your ActiveCampaign API information so you can add it to WordPress, and show you how to make your forms available for use on your site. 1. From your ActiveCampaign account, click "Settings" located in the lower left of the application. 2. Click “Developer” in the left-hand sidebar. 3. 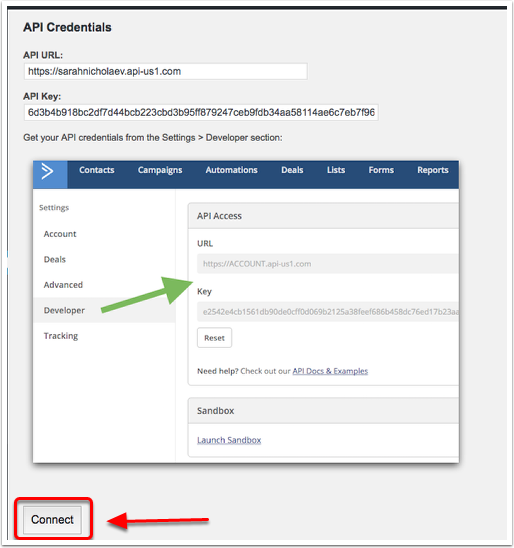 Under the API Access section heading, you'll see your API URL and key. Copy your API URL by clicking it and pressing Control + C on your keyboard. Paste the URL into your WordPress site then do the same for your API key. 4. 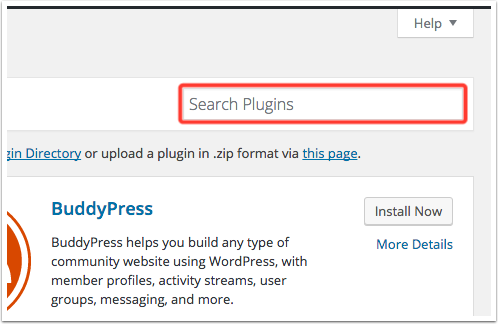 Click the “Connect” button in WordPress. 5. Select which forms should cache locally on your site by clicking the check box next to them. Selecting forms here means you'll be able to insert them into your Wordpress posts and pages. This step is required if you want to use forms on your Wordpress site. You can always select and unselect forms as needed from this page. 6. When finished, click the "Update Settings" button. 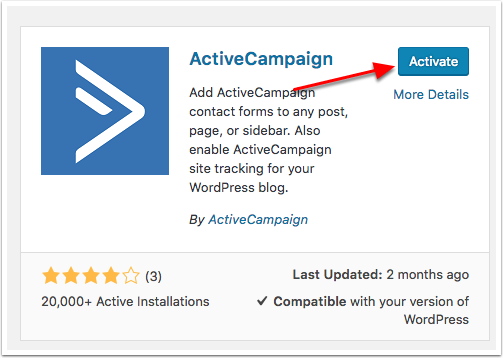 Installing the ActiveCampaign WordPress plugin inserts your Site Tracking code into each page of your WordPress site, allowing you to track page visits. If you have enabled the Conversations feature, this site tracking code will also add the Conversations chat widget to your website. 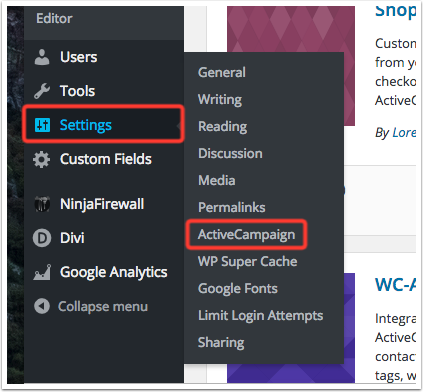 If you already have site tracking enabled on your WordPress site and wish to use the Conversations chat widget, you must upgrade the ActiveCampaign WordPress plugin to the most recent version (7.1). This setting is selected by default and will track page visits and IP addresses for all known contacts without their explicit consent. Page visits and IP addresses are considered personal data. This includes site tracking ability but requires your contacts to confirm tracking consent. You will need to create a tracking consent notice and connect it to this plugin in order to use this option. 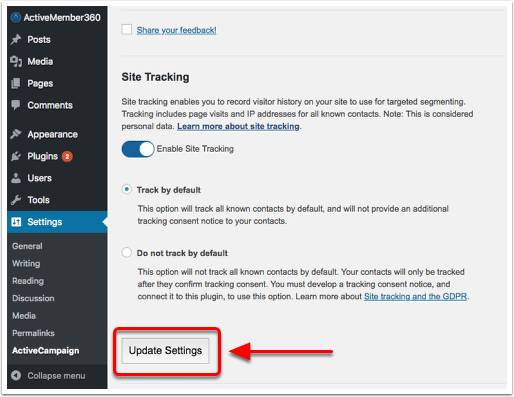 To enable site tracking, click the Enable Site Tracking toggle to its "On" position then select your preferred site tracking option: Track by default or Don't track by default. If you'd like to disable site tracking, click the "Enable site tracking" toggle to its "Off" position. 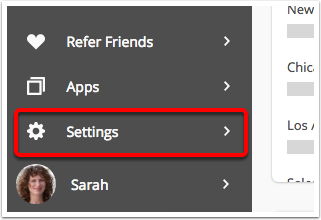 This option will appear on the ActiveCampaign settings page in Wordpress if you have at least one form in your ActiveCampaign account. Now that you've installed and configured the plugin, you can start inserting forms into your posts. The floating box, modal, and floating bar forms are available on Plus, Professional, and Enterprise plans only. Place the cursor where you want the form to appear and click the ActiveCampaign logo. A modal window will appear listing the forms you've created. Click the name of the form you'd like to insert. A shortcode will appear. When the post is previewed or published, the shortcode will be replaced with your ActiveCampaign form. To edit the form, log back into your ActiveCampaign account and edit it there. The changes you make will be reflected in your forms that were placed through the WordPress plugin—you don't need to replace or modify the code. For more information about adding a form to your site, click here.